Christopher walked over to the garden where he figured he would find the rest of the Fresh Veggie family. He ran into Mrs. Tomato first. “Why aren’t you at the barn practising with me?” asked Christopher. “Did we have a practice setup today?” asked Mrs. Tomato, batting her eyelashes at Christopher. Miss. Tomato didn’t respond because she knew Christopher was right. She knew the Fresh Veggie family had a lot of work to do. She couldn’t give Christopher an excuse because, quite frankly, she didn’t have an excuse as to why she didn’t show up for practice. Christopher spoke to the other members and he pretty much got the same response from them. He gathered them together and held a meeting. The Fresh Veggie family knew that Christopher was angry and they knew he was serious. They knew they needed to put their heart and souls into Loud Garden and they knew that for the last few days they hadn’t given Loud Garden the respect it deserved. They knew they needed to change their ways or they would end up losing Loud Garden and Christopher as well. “That sounds more than reasonable,” said Cameron Cauliflower. “Good,” said Christopher, suddenly feeling much better as he was starting to regain his sanity. Christopher found it very difficult to not get emotionally attached to Loud Garden. Who really could blame him though? Loud Garden was his baby and he was proud of it and devoted to making sure it was run properly. It is easy to lose your sanity when others don’t take your passion seriously. 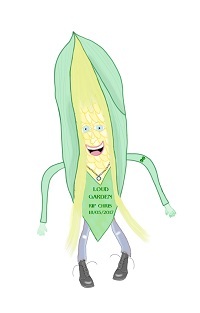 This entry was posted in Christopher Corn Stories, Fresh Veggie Family Stories, Grade 4 Level, Summer Stories, Summer Story Challenge 2017 and tagged angry, barn, Christopher Corn, Christopher Corn and His Sanity, concert, Fresh Veggie Family, garden, heart, pond, sanity. Bookmark the permalink.